THE THREE TREMORS are having a CD listening party at Battlemage Brewery (2870 Scott St #102, Vista, CA 92081) on Friday, September 7th that is free and open to the public, and will be the first time that the entire self -titled debut album will be played for the public. 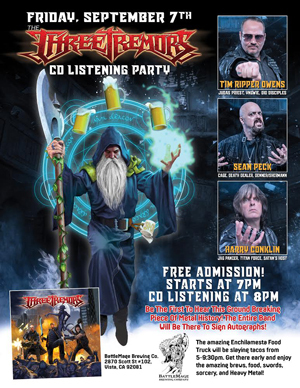 The event will be attended by the entire band, including Tim “Ripper” Owens, Harry “The Tyrant” Conklin, and Sean “The Hell Destroyer” Peck (the event begins at 7pm, while the CD listening will be at 8pm). Marc Sasso (DIO, HALFORD, CAGE, DEATH DEALER, ADRENALINE MOB) is the artist who created album cover for The Three Tremors, and has re-created the Batllemage Brewery mascot just for this event as shown here on the flyer. The band will be selling merchandise there in public for the first time and will offer a free exclusive mini poster with every preorder pak purchased that night. Mexican food will also be available from the incredible Enchilamesta food truck, from 5:00-9:30 that night. "The first time I went to this place I knew I wanted to have the listening party there," continues Peck. "Luckily the owners are huge metal heads blasting stuff like ICED EARTH and GLORY HAMMER all day long, so they were completely stoked on the idea. We are really excited to have some So Cal metal heads come hang with Me, Harry, and Ripper and the band, and rock out to the album while drinking craft beers and eating gourmet Mexican food in a place with swords and battle axes lining the walls! And its free to the public too!" THE THREE TREMORS recently announced their first ever European tour and have their debut self-titled album coming out this Fall on Steel Cartel Records.